As marketers everywhere are learning, targeted and personalized video ads are an effective marketing tool. Ad spend on video in the U.S. has increased from $7.7 billion in 2015 to $13.5 billion in 2017. While video can and usually does cost more than other advertising formats, businesses are finding that video advertising can deliver great ROI. According to Aberdeen Group, video marketers get 66% more qualified leads per year, and experienced a 54% increase in brand awareness. What’s more, 76% of companies that used video said it helped them increase sales. With giants like Facebook launching a new video format to drive retail sales and marketing executives predicting the dominance of short video, it’s clear video is becoming a foundation for any effective marketing campaign. Almost a fifth (19%) of time spent on mobile devices is spent on Facebook. The social network gets over eight billion average daily video views for a total of around 100 million hours. People are 30% more likely to watch videos on their smartphone than on a desktop, and since most people hold their phone upright, vertical video formats do the best with format ratios of 4:5, 2:3, and 9:16. Bonus tip: Kill two birds with one stone and optimize for both Facebook and Instagram with vertical 4:5 videos. 2. Keep it short, and put the best stuff first. 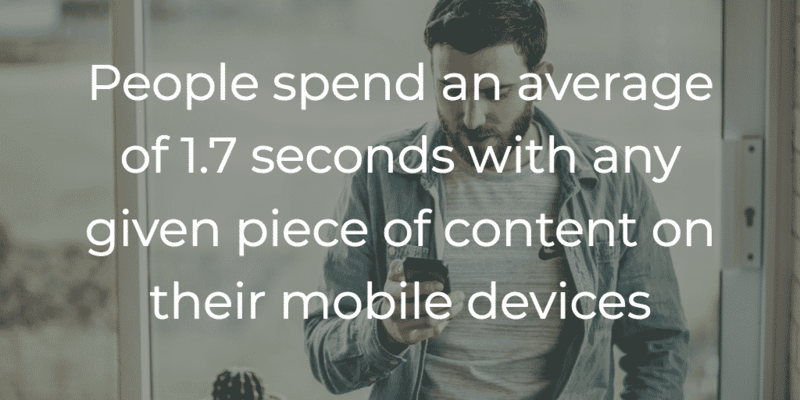 People spend an average of 1.7 seconds with any given piece of content on their mobile devices, and only slightly longer – 2.5 seconds – on desktop. So keep things short and sweet. 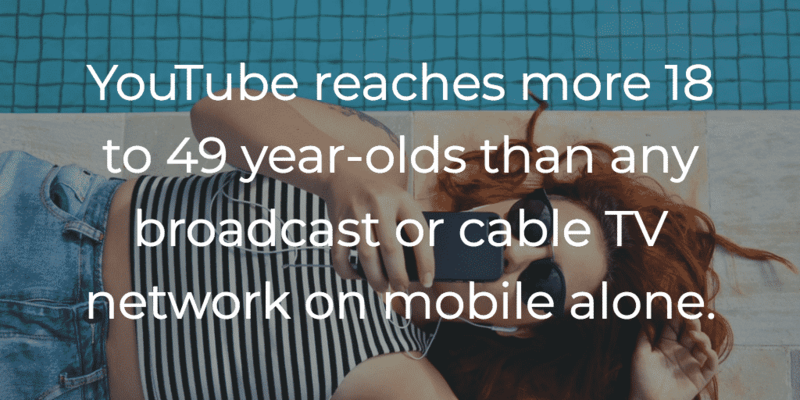 Mobile videos work best when they’re 15 seconds or less, and when your brand or product is featured early. Make “Sound-on!” an option. Up to 85% of video views happen on mute, so make sure if there’s dialogue or voiceovers in your videos, there are captions for viewers watching on mute. And don’t worry – videos on mute don’t mean that your viewers are less engaged; studies by MEC North America showed that branded videos viewed on silent didn’t affect KPIs like brand lift or intent to buy. As long as visuals were engaging and eye-catching right away, they were still effective. 4. Define your audience to a T.
With over 1.49 billion active monthly users on Facebook, it’s pretty important to get specific about your audience. Facebook allows you to target people in specific locations, set age ranges, genders, languages, and even industries, education level, and college attended. Think about your target audience for each video and then build personas. From there, you can start segmenting. A native video is one that’s uploaded directly onto Facebook rather than shared from Youtube, Vimeo, or some other outside video streaming platform. The numbers show that Facebook favors native video formats: native Facebook videos generate up to 530% more comments and a 477% higher average share rate compared to YouTube videos. View rate – the number of people who watched your ad for at least 30 seconds or until the end (whichever comes first), interacted with your video divided by impressions (the number of times your video ad appeared). Average cost-per-view (CPV) – the average amount you’re paying for each view. Pull them in. Choose your thumbnail image carefully. This is first thing viewers see when your video is displayed on a page and should best highlight the video’s content. Keep it short. Like with Facebook videos, shorter videos perform better. Play around with titles, end cards, and CTAs. Little tweaks like this can change the way someone interacts with your video and improve your view rate. Avoid ad fatigue. You don’t want viewers to get tired of your ad because they’ve seen it too many times. Consider having at least two or three versions of your ad to keep things engaging, and to test which version performs best. Interests: Reach people interested in these topics, even when they visit pages about other topics. Intent and life events: Find customers who are researching products and actively considering buying a service or product like yours. Topics: Target your video ads to specific topics on YouTube and the Display Network. Topic targeting helps you reach a wide range of videos, channels, and websites. For example, if you target “handbags”, your ad will be shown to people watching videos about handbags. Remarketing: Reach viewers based on their past interactions with your videos, TrueView ads or YouTube channel. Keywords: Depending on your video ad format, you can show your video ads based on words or phrases–keywords–related to a YouTube video or channel. But take caution with this approach as keyword targeting since this can significantly lower how often your ad is shown. Your ad doesn’t just exist in a vacuum – it’s part of your brand, and an entire campaign which includes your YouTube channel landing page, your website, and other content. Make sure everything is on brand and visually aligned, so that the viewer knows exactly which brand site they’re on. Clear CTAs at the end or middle of your ads should take viewers either to your website to purchase or to your YouTube channel where they’ll have the opportunity to engage with additional content. Video views on Twitter have grown 220x since last year. What’s more, videos on Twitter are 6x more likely to be retweeted than photos and 93% of Twitter’s video views happen on a mobile device. Video ads on Twitter work, especially with Twitter’s audience – 53% are early adopters, 64% are more likely to influence purchase, and 80% are affluent millennials. Twitter videos can’t go past 2 minutes and 20 seconds, unless by special request. 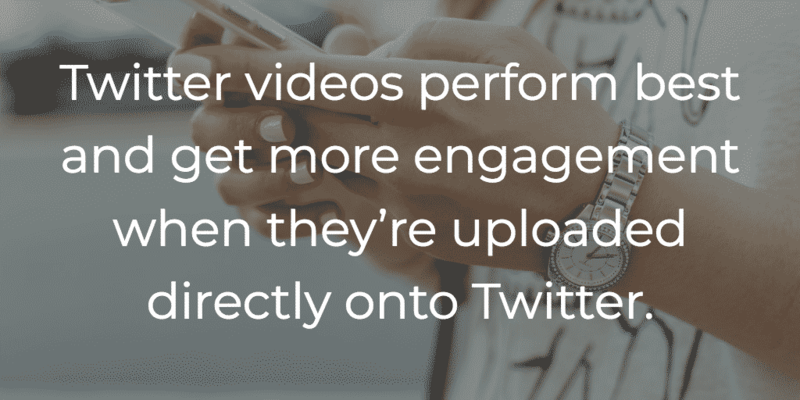 And like Facebook ads, Twitter videos perform best and get more engagement when they’re uploaded directly onto Twitter. Twitter data shows that native videos get 2.5 times more replies, 2.8 times more retweets, and 1.9 times more likes than linked videos. Lastly, make sure your videos have aspect ratios of 3:1 or 1:3 and dimensions between 32×32 and 1280×1024. Like with YouTube and Facebook, Twitter offers fine-tuned audience targeting options from interest to keyword, to device targeting. What’s more you can choose to do follower targeting to include 10-25 specific @handles to make sure you’re reaching a specific audience. You can even choose to do behavior-based targeting, which allows you to reach users based on how they behave both online and offline. A caveat to the above: While Twitter advises to always target by location and device, the company also suggests using only one type of audience targeting with each campaign, and running multiple campaigns since this makes it easier to track what campaigns are working for specific audience and optimize accordingly. When a campaign isn’t performing, remove follower groups, Tweets, and keywords and refresh them with others to find what will work. As a video marketer, video retargeting is the one digital marketing strategy you can’t ignore. Video retargeting is a crucial way to reengage with customers. To drive conversions and increase engagement, you need to be where your shoppers are – whether they’re on their phones, tablets, or desktops – on Facebook, YouTube, or Twitter. With the three channels mentioned above, it’s possible to make one video and deploy and optimize it across all channels for maximum reach. Video engages viewers and, if the content is personalized, it can have a huge impact on product decisions, brand awareness, and cross-channel touchpoints. And until now, there hasn’t been a way to retarget this vast audience with an engaging video format that offers one-to-one personalization and relevant product recommendations. Criteo Dynamic Retargeting delivers video ads targeted at individuals based on their behavior and shopping intent. To learn more about how video retargeting works, read our post here, and download our Retargeting 201 Guide below!